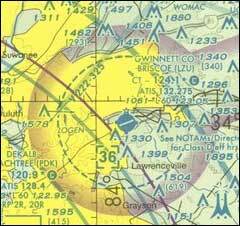 Gwinnett County Airport is located on approximately 500 acres just one mile northeast of the city of Lawrenceville. Briscoe Field is surrounded by industrial areas to the south and west, the Gwinnett Progress Center to the north, and the Alcovy River to the east. The airport consists of a single 6,021-foot-long by 100-foot-wide runway capable of handling all light general aviation and most corporate jet aircraft in operation today. In 1991, Gwinnett County Airport completed a $25 million series of improvements which included the expansion of airport property to the current 500 acres, construction of the current runway and parallel taxiway, and installation of an Instrument Landing System (ILS) on Runway 25. We are also equipped with a Level III AWOS system and an air traffic control tower. Gwinnett County Airport is served by two Fixed Base Operators (FBOs) operating at the airport. Gwinnett Aviation is located on the north ramp and can be reached from 6:00am to midnight daily at 770.995.5592. Aircraft Specialists is located on the south ramp and can be reached 24/7 at 770.277.9000. Both FBOs provide an excellent level of service to their users. The tower is open daily between the hours of 7:00am and 9:00pm. During this time, pilots can contact the tower using 124.10 as the tower frequency and 121.80 as the ground control frequency. After hours, 124.10 becomes the Common Traffic Advisory Frequency (CTAF). Pilots can also dial into the AWOS for weather information using 132.27. Gwinnett County Airport is governed by the Airport Authority. This five-member board meets on the second Thursday of every month at 6:00pm.